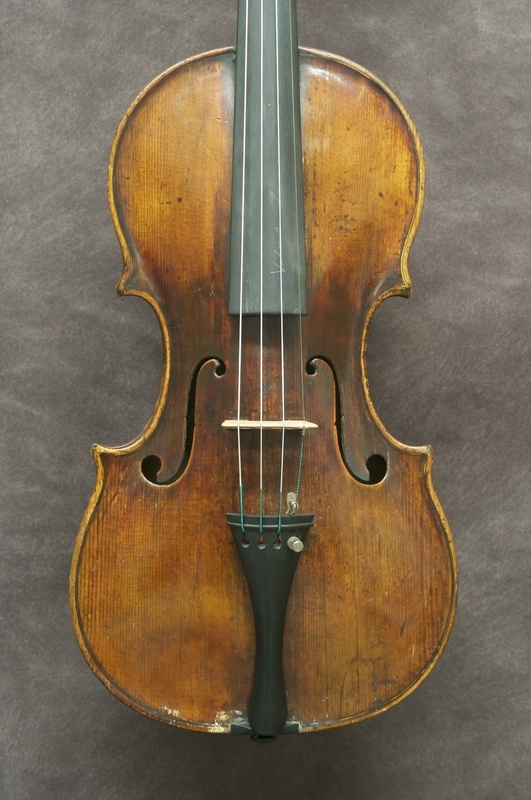 Click on each image to compare two violins. "Born at Udine (ancient name-Vedinum), sixty miles from Venice, 1665 possibly of Jewish parentage. Youthful enthusiasm set his attention on Cremona, and thither he went to work under the critical guidance of Nicolo Amati. Returned to native place and worked there until about 1692, then proceeded to Venice where his productivity was zealously carried on to his 83rd year, 1748. Versatility of modelling a remarkably characteristic feature. Little bits of the Amati, and the Stainer, and even Maggini combined in an original manner. Whole contour has a personality entitling the instruments to take rank as classics-general appearance may not inaptly be called "heroic". Outline, quite Amatese, impressively conducts the eye to real grandeur of curves. 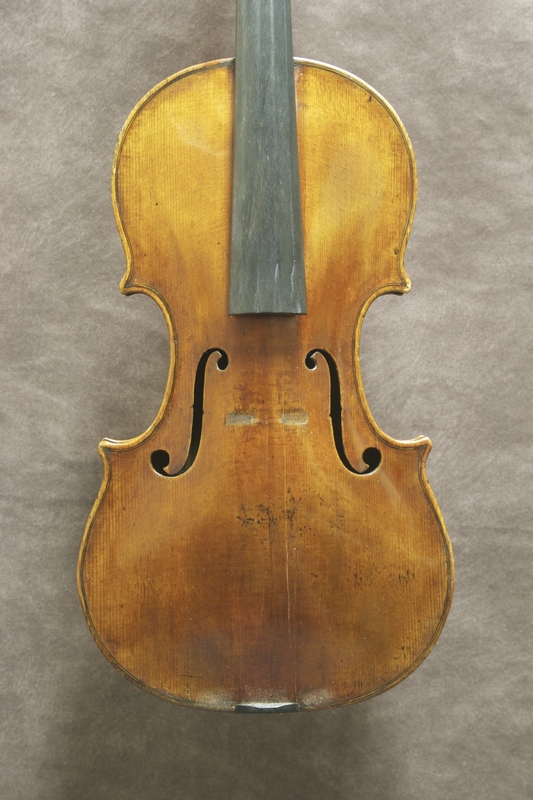 Also the same eye can revel in the delicacy of the margins, slightly narrower than those of the Stradivarius or Amati. Comers are just as harmonious and natural looking. Middle bouts have an unusually circular appearance, but nothing unduly exaggerated or any sacrifice of unity. Arching consistent with, originality, the front somewhat Tyrolese in its medium rise, whilst the back contents itself with less. Take another look at the contour and notice the beautifully wrought ideas conceived to give a broad and ma~telly effect. Purfling also exquisitely accurate, examine it with a magnifying glass and its flawless neatness will stand the test. Scrolls have a touch of the Stainer, and generally of a vigour of conception and freedom of handling not often surpassed by any maker, further embellished by minute sculpturing giving grace to dignity. Notice a peculiarity which is to be found at the termination of the two grooves at the front of scroll opposite to the throat, and where, the two grooves merge into one large one, occupying the whole width of scroll just there. Also the first curve of scroll is rarely left high up, so that it over shadows the boss like a long eyelash. Edges of the upper surfaces of the turns are very attractive. Sound-holes variable, some having the "abandon" and long swing of the Amati, beautifully in accordance with classicality, while others semi-adhere to the straighter Stainer type, but with absolute avoidance of stiffness. Belly wood always finely acoustical, and of perfectly straight grain whether narrow, medium or wide. Backs mostly of a small flame (almost like a rich piece of plush), very pretty, and seldom cut slab-wise, though there are a few examples with bird's eye maple. Several shades of varnish, mostly a golden-brown, sometimes an orange-red, and occasionally a darker red. Generally of brilliant appearance, often splendidly transparent and soft, but also at times rather hard and dry with its usual accompaniment of crackling. Nearly always plentifully applied, occasionally, just the reverse. Tonal quality resonant and very responsive, not of extraordinary brilliancy but of good carrying power, richly mellow, and in fact all the attributes that soloists are continually hankering after. This tone has the deep sonority of a Maggini combined with the more clarified bell-like Amatese. Early instruments show distinct Tyrolese influences, a few being rather excessively arched and looking a trifle squeezed across the middle bouts. Their tonal quality is mellow enough but has not the round clearness of the later dated. Best period, 1740-1747, the years of old age but of no declining power. Some instruments labelled and passed off as genuine Amatis. Emile Sauret used one for many years, and its remarkable sympathetic clarity was especially noticed by critics. Few violas seem to be known. 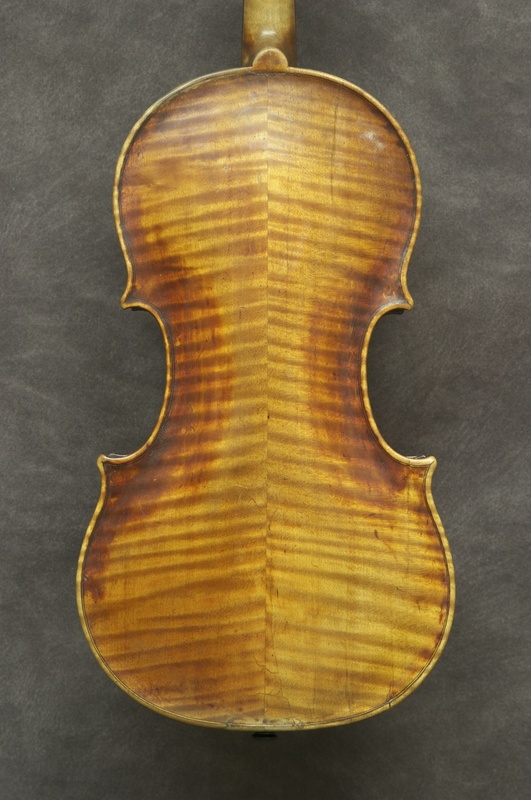 Several fine toned and beautiful cellos are in the possession of renowned virtuosi. Also built double basses which are pronounced wondrous even by the most fastidious critics... "
"Name branded at the tailpin -Santo on the upper part, and Seraphin on the lower. 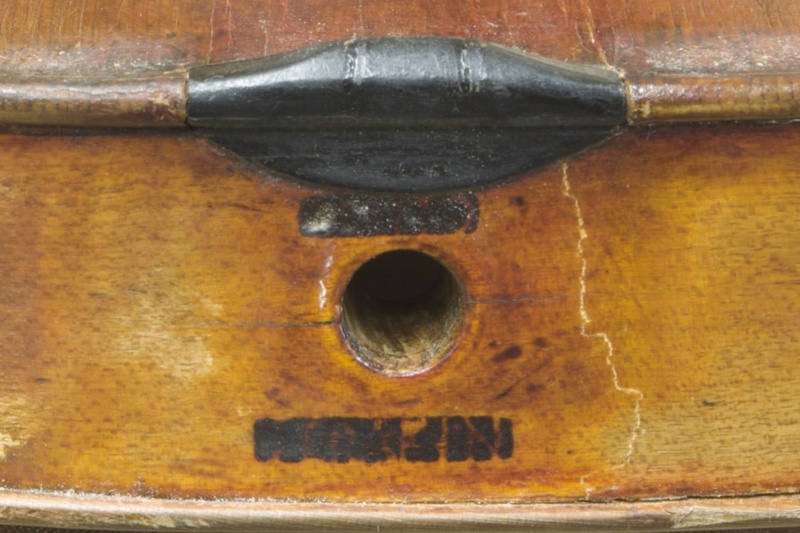 Name also sometimes written very legibly inside the instrument..."